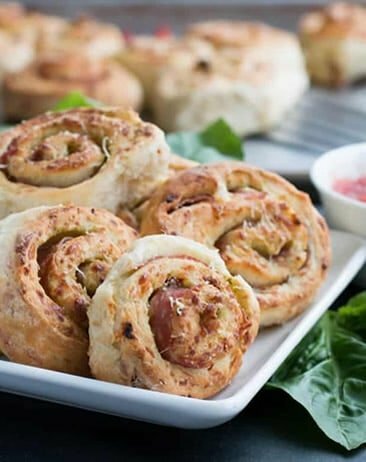 This post is for my fellow sweet and savory food lovers. 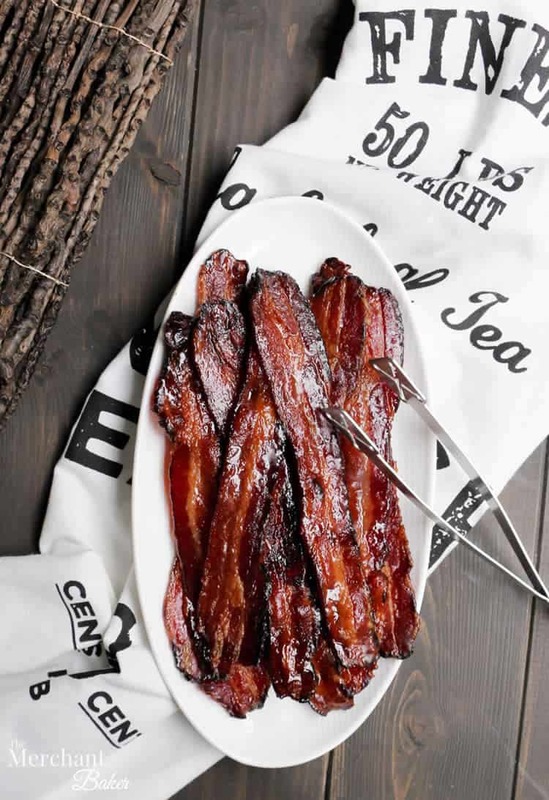 Brown Sugar Maple Glazed Bacon checks all the boxes for those who are more than happy to have their smokey bacon mingle with the pools of maple syrup on a plate of pancakes. 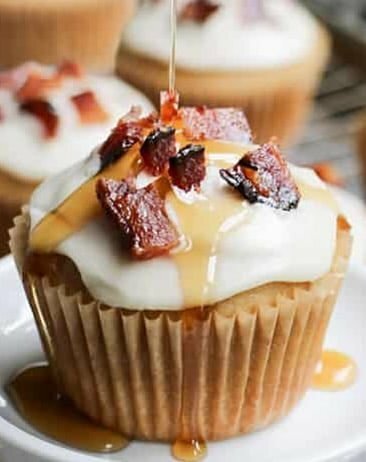 Hey, remember Sticky Maple Bacon Biscuits? Yeahhhh….those never last more than a few minutes when they come out of the oven. 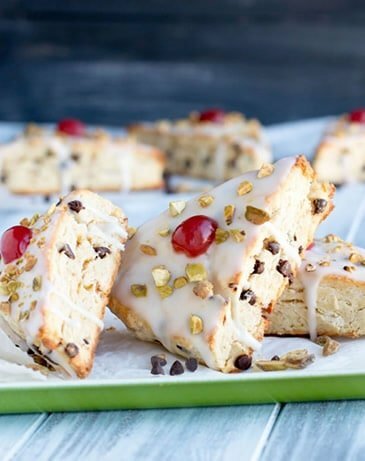 Just try to pull off a pillowy sticky piece of that yum and not go back for more. I’m sure it’s possible, but I’ve never personally seen it happen. So this is a little like that, but without the biscuits. 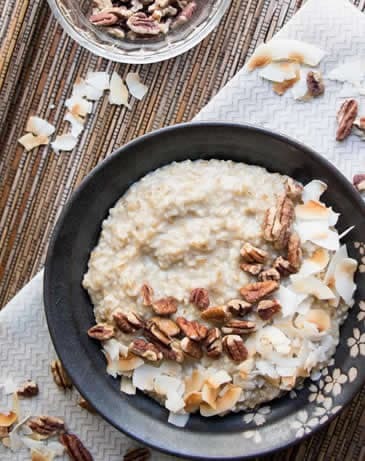 You know by now that every recipe has a story behind it, and this one is no different. 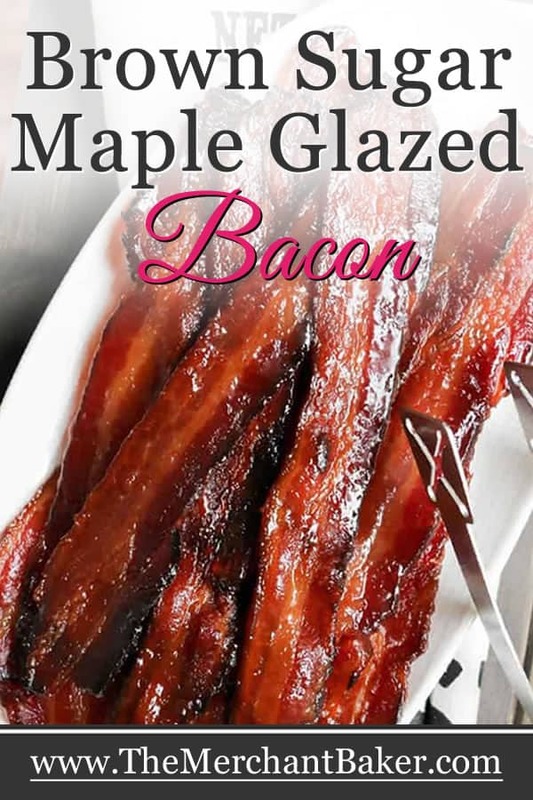 The truth is, I had absolutely no plan to create a post for Brown Sugar Maple Glazed Bacon. I mean, it was definitely on my mind to post it someday, but not today. And really, not even this year. 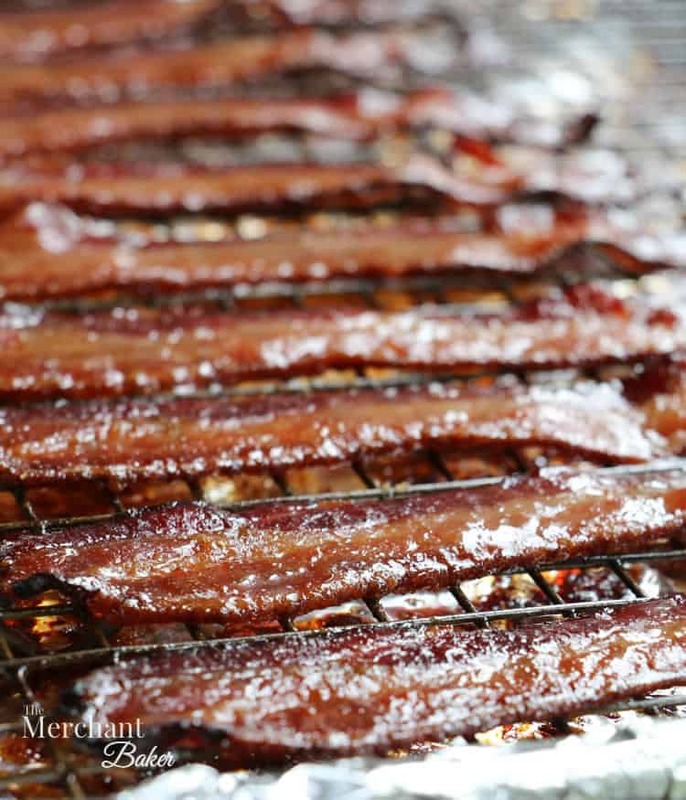 It was more of a fleeting thought like…”Someday, I should do a quick post for candied bacon.” That’s it. Back burner. Someday. So, I was working on developing a recipe for my next post. And, I had been pretty successful of late with most of my recipes, a lucky streak, if you will. It had been awhile since a recipe tried my patience as much as the one that was currently on my plate. I’m not going to go into all of the details of that now; you’ll hear all about next week. But, suffice to say I was struggling with a recipe. I finally figured it all out, but part of the path to success was this bacon. Yep, somewhere along the way I decided I needed to add some candied bacon to my recipe. I know it’s cliche, but really, bacon kinda does make everything better, doesn’t it? Now, the bacon wasn’t going to “fix” the issues I was facing, but once I fixed the issues, the bacon was definitely going to take it to another level. At least I had hoped it would. Because that recipe? Honestly? I was over it. O. Ver. It. Also, in the back of my mind, I thought if the recipe I was working on simply didn’t work out, I’d just post the bacon and call it a day. However, once it did all work out, I thought about putting both recipes in one post. But I kinda hate having to find a recipe for one thing, in a recipe for something else. Do you know what I mean? Then, I have to remember what the main recipe is to get to the related recipe. It’s annoying and I try to avoid it where possible. I mean…who knows how you’re going to use this bacon??? You might not ever use it for my next post. 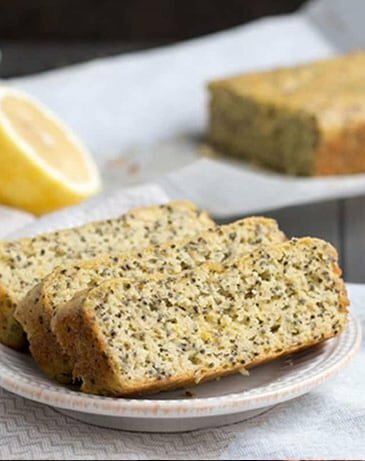 You might simply want it for a whole other recipe, or you might want it for a sandwich, or as is for breakfast, or as is for a snack…. But again, if you’re a sweet and salty lover…I’m pretty sure you’re just going to want it. So, I gave the bacon it’s very own post. The good news is…it’s not hard to make. 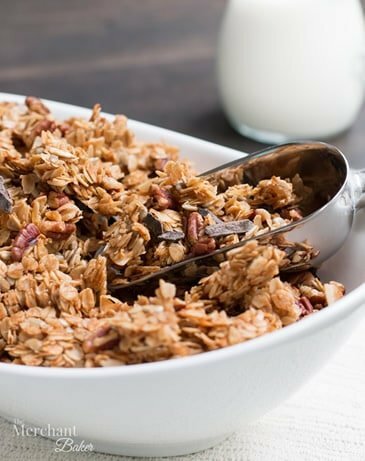 You’ll need just three ingredients and a watchful eye. Let’s start with the bacon. First, let me tell you what I used…. I used an organic, uncured, nitrate free, applewood smoked bacon. I know that’s a mouthful, but that’s how we roll with bacon. Mine came in a 12 ounce package instead of 16 ounces, like typical bacon. I assume that’s because it’s so much more expensive per pound that they dare not package it in a 16 ounce package or the comparison in price to typical bacon would be even more alarming than it already is. You should use your favorite bacon. 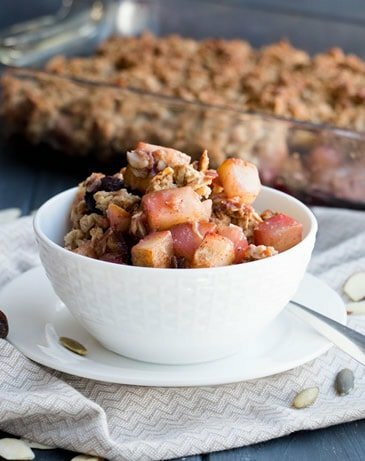 I prefer that you use some type of smoked bacon just because the whole salty, smokey, sweet flavor combo really works well here. I didn’t have a choice on the thickness of my bacon. Some bacon is sliced thick, some thin. Mine was thick-ish. In other words, it was thick enough that it wasn’t going to get super crispy. It would have some crispy edges, but it would be more meaty with a hearty chew. 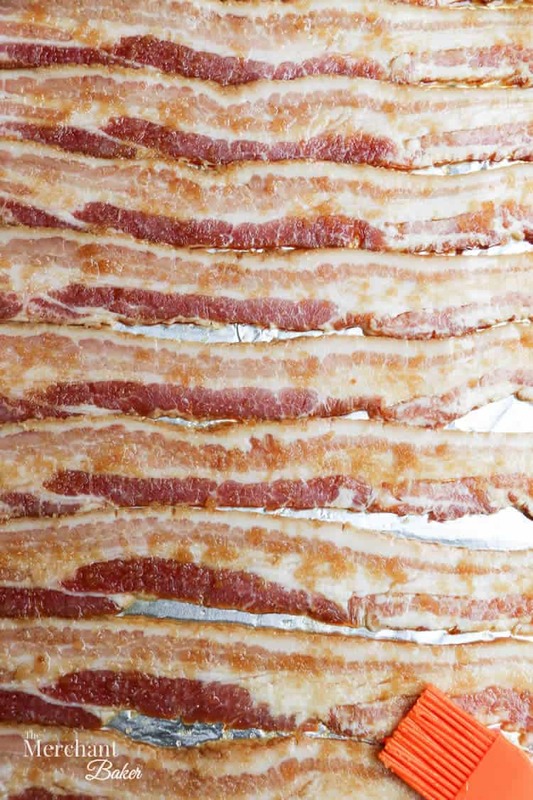 Thinner bacon will give you a crispier result. It will also cook faster, so just keep an eye on it if you have a thinner bacon. This one is easy. 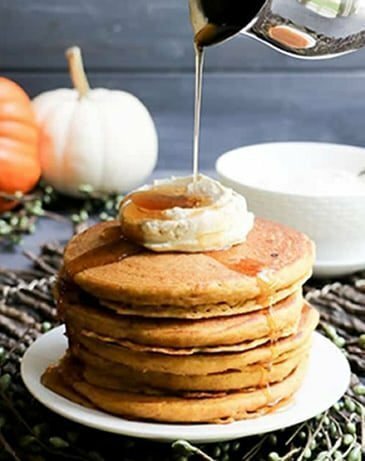 Use real maple syrup. “Pancake Syrup” is not maple syrup. Read the label. It’s generally corn syrup, high fructose corn syrup, flavorings and a bunch of other things. And if you want to get really particular, I used, “Grade A Amber.” For this recipe, any real maple syrup will do. I used two pans. One to prep the bacon, the other to cook the bacon. You’ll see in the photos that there’s one pan that doesn’t have the cooking rack, and the one that does. The reason why I used two pans is because I didn’t want any excess syrup or sugar gathering in the bottom of the cooking pan. Sugar burns and while some is going to definitely end up in the bottom of the pan during cooking, I didn’t want extra, so I took the precaution. However, I was totally cool with extra syrup or sugar in the prep pan. The bacon would be very happy sitting in it while I worked on coating each slice. In both cases, I lined the pans with foil for easy clean up. The only difference was that I added a rack to the pan I was going to use for cooking, so that the fat could drip away from the bacon as it cooked. I also sprayed that rack with cooking spray to help prevent sticking. Simply spread the bacon out on the pan. 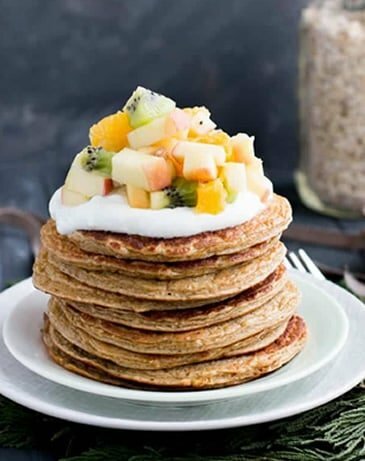 Drizzle it with maple syrup. I’m not giving you a measurement for this, but I did take a photo so you can see how much I used. Drizzle means drizzle, not pour. Good maple syrup can be pricey. Why waste it in the bottom of the pan? I drizzled a thin line of syrup down each slice and used a brush to evenly distribute it. You just need enough to thoroughly brush over the slice. Then, I flipped the strips and repeated the process. Next up, the brown sugar. For this, I took a measurement for you. I used 2 Tablespoons to do one side of all of the slices and 2 Tablespoons for the other side. It was a total of 1/4 cup. You don’t really need a measurement though. Just sprinkle the sugar down each slice. As you’re working, the sugar will start to soak into the syrup that’s already there. Then, I used a brush to distribute it evenly and to have it mix up a bit with the syrup. At this point, I was ready to flip them for the final coating of sugar. I flipped and transferred them to the second pan in one fell swoop. That final coating of sugar would happen in the second pan. Same step. Different pan. Sprinkle the sugar. Distribute with a brush and you are good to go. That’s right. 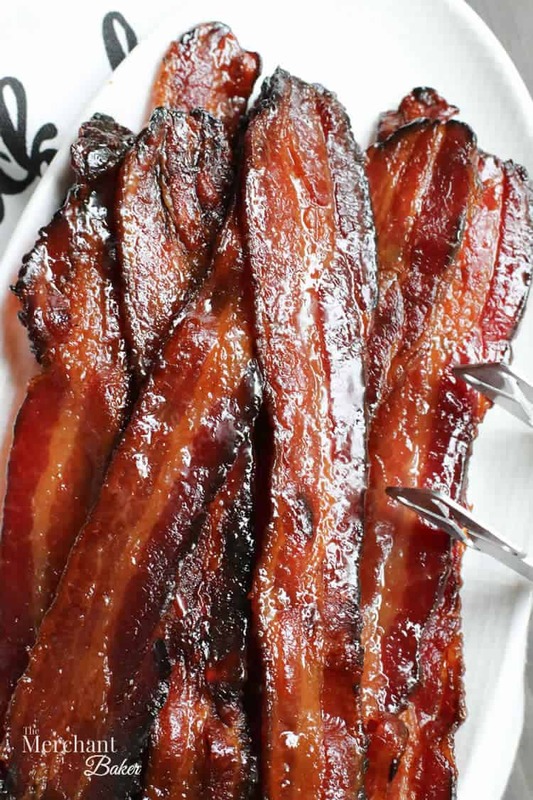 You’re going to put your bacon into a cold oven (on the middle rack) and then set the temperature to 350 degrees F.
Cooking bacon slowly renders out the most fat. This is how I bake bacon when I’m just making regular ole’ bacon for breakfast. It’s also how I cook my Spinach Feta Egg White Cups. Cold oven. Works beautifully in these two instances. I love it because the extra bonus is that there’s no planning ahead or waiting for preheating. So, placing the bacon in a cold oven and then turning the oven on allows the bacon to slowly cook while the oven heats. Plus, we’ve got syrup and sugar going on here. I didn’t want to risk burning the sugar by immediately exposing it to a high heat oven before we had fully cooked bacon. Baking time is going to vary. It will vary based on your oven and whether it runs hot or cold. 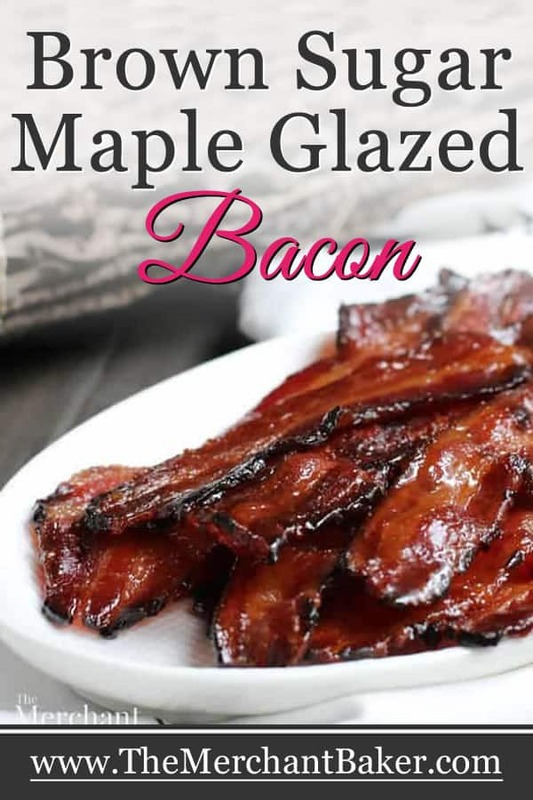 It will vary based on the thickness of your bacon. It will vary with convection vs. conventional ovens. So here’s what I’m going to tell you to do. Check it at 15 minutes. That will give you a gauge of how long it’s going to take. If it’s nowhere near being done, check it again in 5 minutes and keep adding time as necessary. Mine took between 25 and 30 minutes. Don’t leave to do something else after that 15 minute mark. 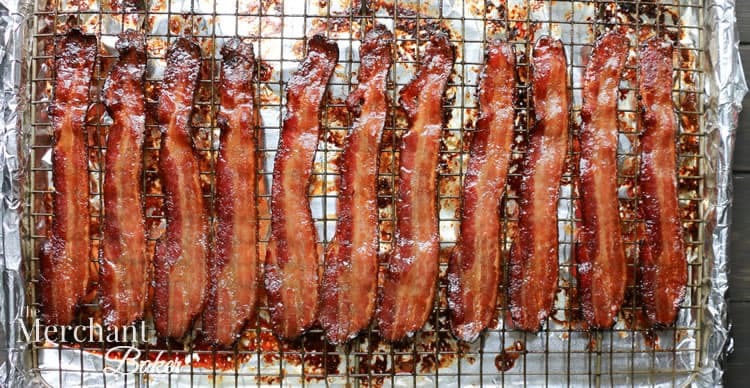 Both bacon and sugar can burn in a blink if you’re not paying attention. Once it’s done, remove it from the oven. I give it just a few minutes on the rack. Then I like to transfer it to a parchment or waxed paper lined sheet while the sugars are still hot and syrupy. Otherwise, you may have issues with the bacon sticking to the rack. You might not. I didn’t wait to find out. 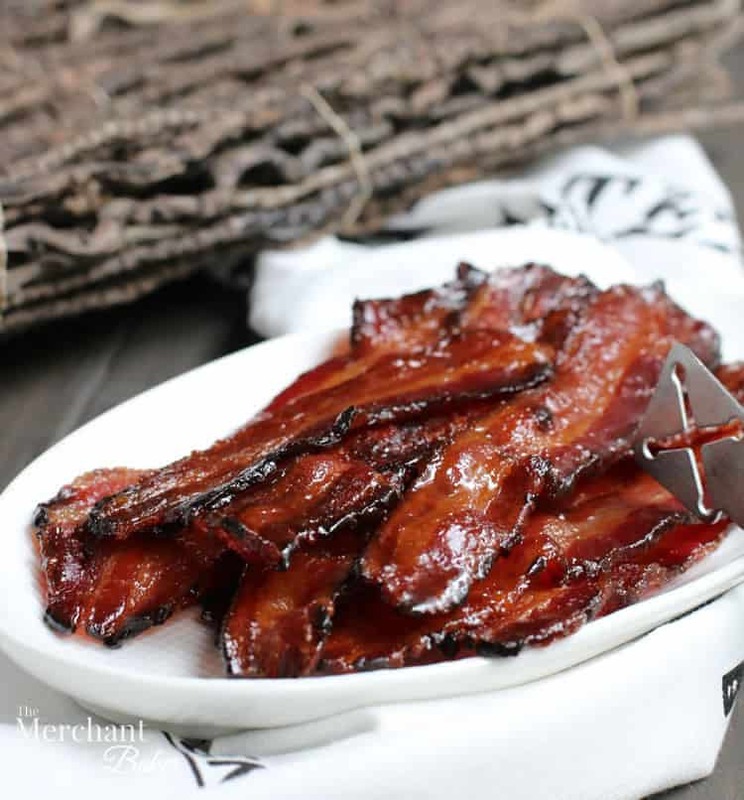 What you will have is some gorgeous mahogany colored bacon, all sweet and sticky and smokey and syrupy. I know. It looks pretty amazing doesn’t it? 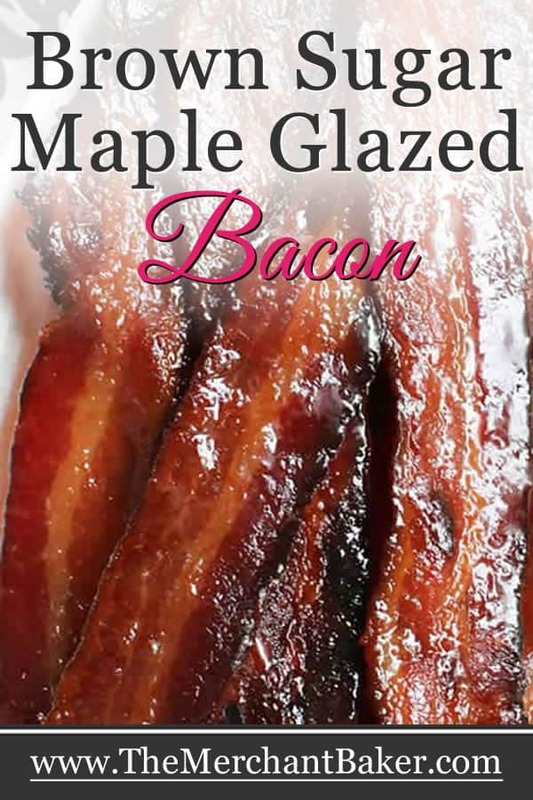 So there you have it, Brown Sugar Maple Glazed Bacon. In this case, necessity was the mother of necessity. Or maybe frustration/desperation/lost patience was the mother. Whatever the case, “someday” turned out to be today. Line two baking sheets with foil. One pan will be used to prep the bacon. Place a baking rack into the other pan and spray with cooking spray. Set aside. Separate bacon strips and line up on the pan without the rack. Drizzle maple syrup over the slices and using a pastry brush, evenly distribute it over the top all of the slices. Flip the slices and repeat. Sprinkle about 2 Tablespoons of brown sugar evenly onto the tops of the maple coated bacon. Use the pastry brush to distribute it evenly. (The sugar will begin to mix with the syrup already on the bacon.) 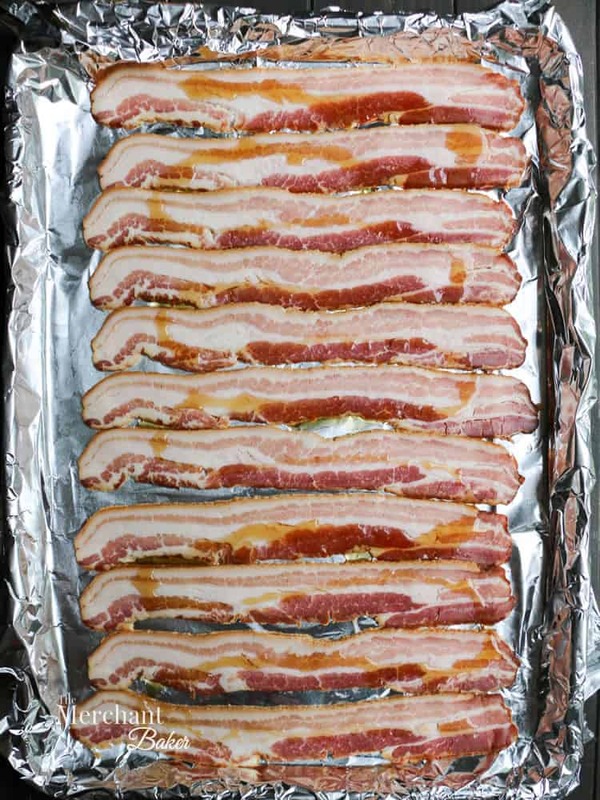 Flip the bacon over and transfer the slices to the baking pan with the rack. 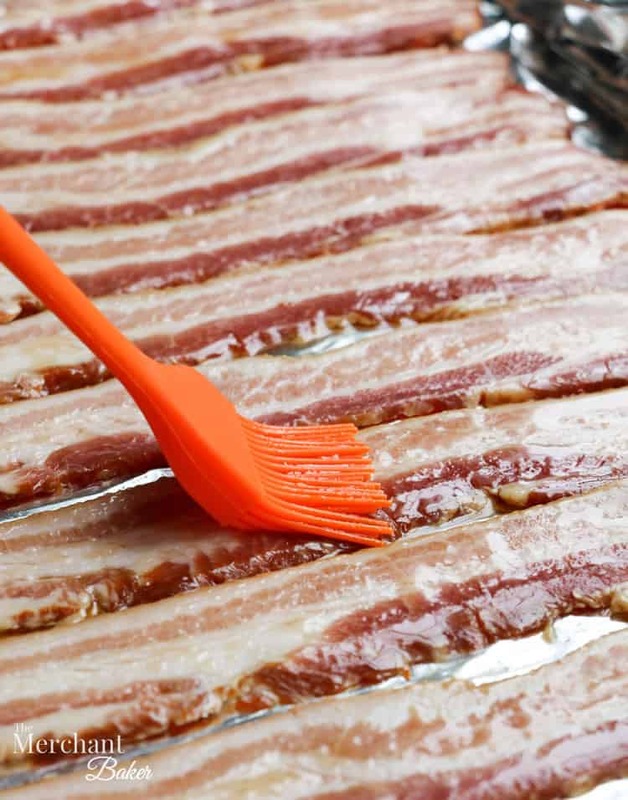 Sprinkle another 2 Tablespoons of brown sugar over the tops of the bacon, using the pastry brush again to distribute. Place baking sheet into a cold oven on the middle rack. 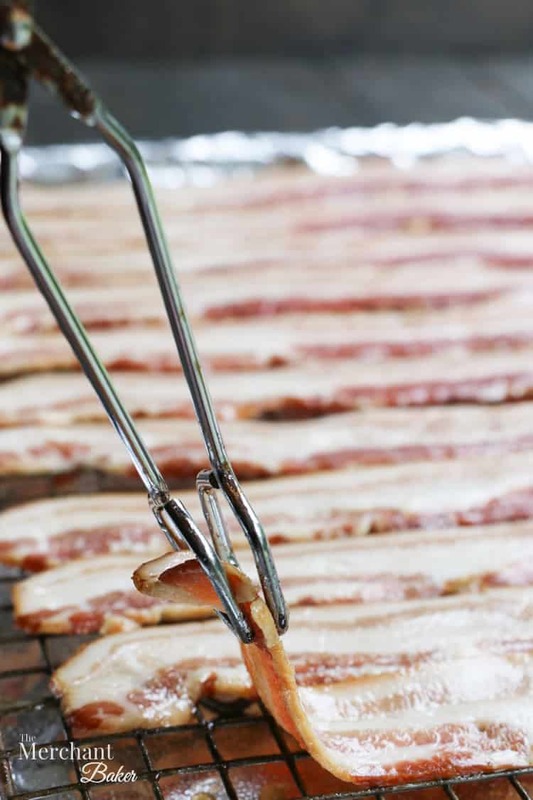 Set oven temperature to 350 degrees F. and allow to come to temperature while the bacon is in the oven. Check at 15 minutes, then every 2-5 minutes until bacon is deeply browned and shiny. Keep an eye on it so that the sugar doesn't burn. Mine took between 25-30 minutes. Remove from oven. Allow to cool for a couple of minutes, then serve. Store covered in refrigerator up to 3 days. 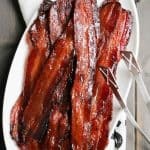 You can reheat the bacon in the microwave, loosely covered with waxed paper or plastic wrap, for a few seconds per slice. 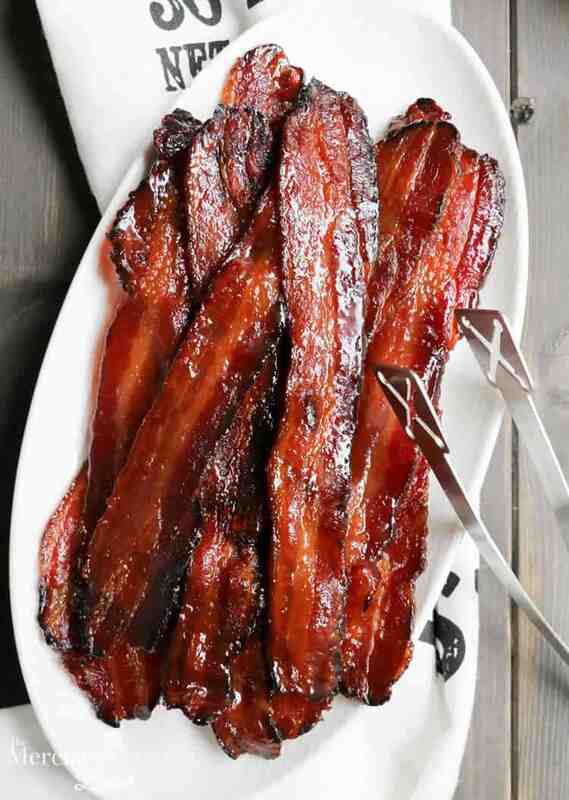 *I used organic, nitrate free, uncured, applewood smoked bacon. Feel free to use your favorite bacon. My slices were medium thick. If you have thinner slices, your baking time will be shorter and your slices crispier. 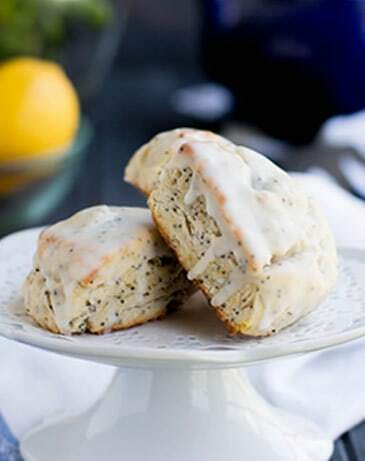 *I used two pans for this recipe, one for prep and one for baking. I did this to avoid having too much excess syrup and sugar falling on the baking pan, worried that it would burn well before my bacon was done. Instead, I used the second pan so that I could freely drizzle and sprinkle without fear of any excess falling through the rack. 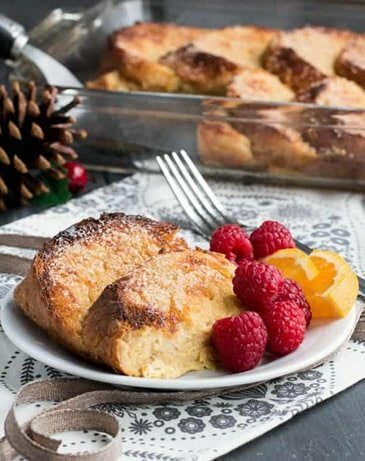 If you prefer to use one pan, just be careful when adding your syrup and sugar. 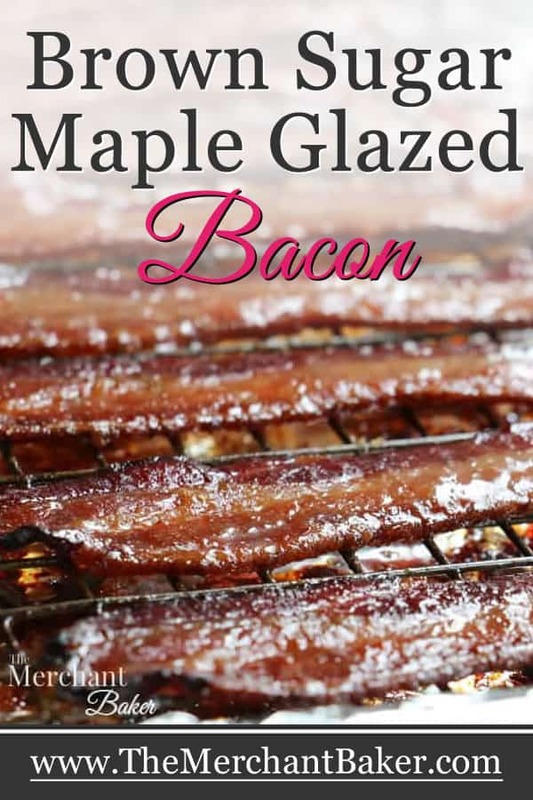 Thanks Ramona, for the great tips on how to make this tasty looking glazed bacon. You’re welcome, Joe! The bacon was delish! Thanks for stopping by, Valentina! The bacon was delish. 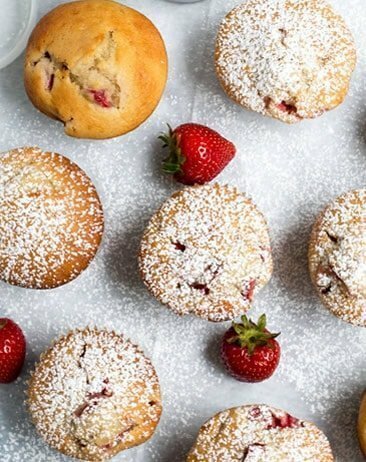 I chopped it up and topped these yummy muffins with it! Soooo good!